(Manresa, 1960) Joan studied architecture at ETSA Barcelona, UPC (1986). He is the founding partner of SaAS, director of the Construction Department from Architecture School La Salle, URL, and member of the Sustainability Committee of the Metropolitan Strategic Plan of Barcelona. He has been professor of different courses and Masters at ETSAB, UPC, La Salle URL and UIC. He has lectured and given seminars in several universities and institutions of Catalonia, Madrid, Portugal, France, Italy, Brussels, Morocco, Algeria, Argentina, Uruguay and Chile. (Preetz, 1965) Christoph studied architecture at Technische Universität Braunschweig, Germany (1998) and carpentry in the Carpentry Guild, Kreis Plön, Germany (1986). He is professor of Construction at Architecture School La Salle, URL, coordinator of the module of Sustainable Building of the “Master in Engineering and Management of Renewable Energies” of the Institute for Life Long Learning – IL3, UB . He is the coordinator of the research area at SaAs since 2007. (Barcelona, 1973) Neus studied architecture at ETSA Barcelona UPC (1999). She works at SaAS since 2005 as a project coordinator. She has taken an academic year at UC Dublin. (Palma de Mallorca, 1981) Aina studied architecture at ETSA Barcelona UPC (2007) She works at SaAS since 2006. (Buenos Aires, 1974) Federico studied architecture at Universidad de Buenos Aires (2000). He works at SaAS since 2003 as a project coordinator. Doctorate Program of Urbanism at ETSAB (2002-2003). (Barcelona, 1981) Oriol is doing his Final Thesis at ETSA Vallés UPC. 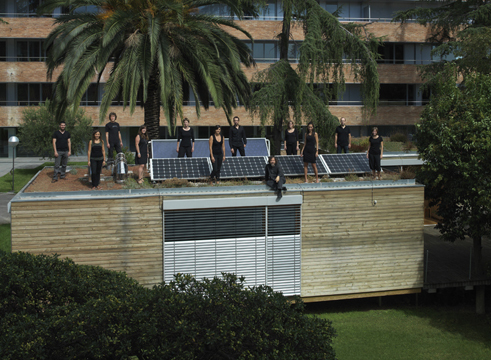 He has taken an academic year at ENSAM -École National Superieur d’Architecture de Marseille. (Lübeck, 1977) BA European Economics en Nottingham Trent University (2003). Current student of MSc Architecture: Advanced Environmental and Energy Studies from the University of East London, based at the Centre for Alternative Technology, Wales, UK. (Barcelona, 1985) is doing his Final Thesis at at the School of Engineering and Architecture La Salle. He has taken an academic year at STU – Slovenská Technická Univerzita de Bratislava.